THIRD SECTION OF THE WELL KNOWN HIGHLINE IN NYC WITH AN EDGIER DESIGN TO COMPLIMENT THE SCALE OF NEW DEVELOPMENT IN HUDSON YARDS. Section 3 of the High Line is unique in its east-west orientation, its proximity to the Hudson River and the vast amount of new development that will one day edge the site. 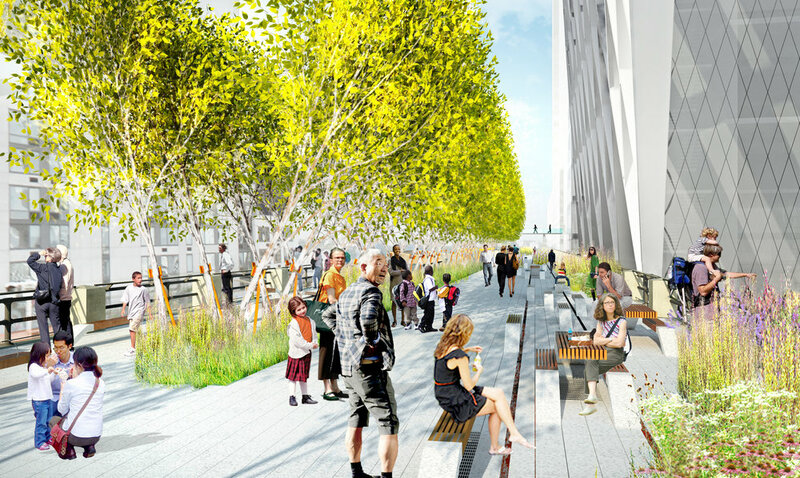 For Section 3 Field Operations was asked by Friends of the High Line to be bolder and edgier than the previous two phases. The reason for this request is based on the need to stand and visually compete with the enormous scale of the new development. The orientation to the river, the view down 10th Avenue from the spur and the view down 11th Avenue were all key considerations driving the design proposals. Several of our proposals became real and were built as part of section 3.